Ahead of the 2016 GCE session, Fako News Centre interviewed the Principal of Bilingual Grammar School (BGS), Molyko, Buea, Ms Lois Ikome. In the interview, she disclosed that her school records better results in Mathematics at the Advance Level than the Ordinary level because most of the students who take the subject at the Advanced level are those who have decided to do the subject and had passed it at the Ordinary Level. She maintained that at the Ordinary Level, the subject is compulsory and most students who do not intend to continue with the subject after the level are compelled to register the subject. However, to understand how Mathematics is taught and the possible reasons why students fail the subject, Fako News Cantre accompanied the Head of Department of Mathematics, Ngulefac Fidelis Amambo, at BGS Molyko, to the classroom during one of his revision classes with Form Five students preparing for the GCE, on the 19th of May 2016. During the lesson, we observed that after solving one example on the board, Mr. Ngulefac gave many exercises on the topic and spent time moving from one bench to another to crosscheck the students’ notebooks to confirm if they were doing the exercises correctly. He also asked students to solve the problems on the board. After solving any problem, he asked questions to know where the students have difficulties. He also allowed them to ask questions to get clarification on areas they did not understand. Mr. Ngulefac appreciates students who find solutions to the problems he gives and encourages them. Mr Ngulefac explained to Fako News Centre that he gives a lot of exercises and insists they are solved in classroom because the students may never do them when they go home. The mathematics teacher however lamented that the student population per class is large (student-teacher ratio). According to him, some classes have up to 70 students and only 50 minutes are allocated per lesson. He explained that, this makes it difficult for the teacher to spend at least a minute with each student before the end of the class. Hence, the teacher will hardly identify those students who need extra attention. He added that most students come to a maths class with plain line exercise books instead of square lines. Others do not have calculators and a set of mathematical instruments needed and this are just some of the reasons why they fail the subject, he noted. Being in a revision class, he cautioned his students to be prudent during the GCE exams not to allow other students borrow their writing material. He told his students that some students fail mathematics even before the exams start and therefore come to distract those who are serious. To encourage students develop interest in mathematics, the school has created a ‘Mathematics Club’. Students’ problems in the subject are often addressed during club activities were teachers and other students who excel in the subject help others to solve problems. 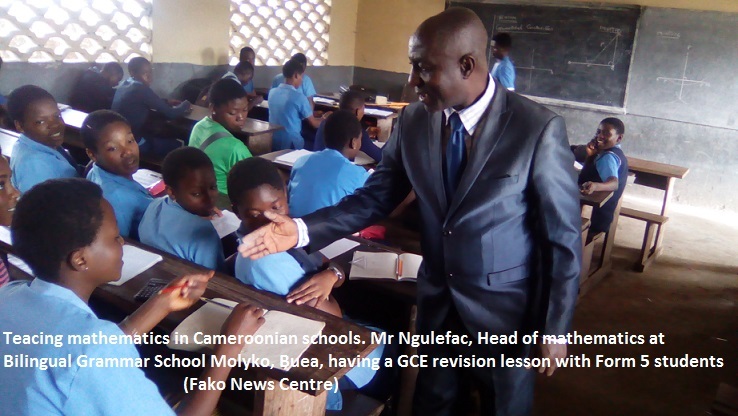 HOW COULD CAMEROON MAKE MATHS RESULTS IMPROVE AT THE GCE ORDINARY LEVEL? Mathematics is not an easy subject. There are students who are naturally gifted in the subject and will always do well no matter the circumstances they find themselves in. There are other students who might not be naturally gifted in the subject but do well through hard work and support from their teachers and parents. There are those who are naturally weak in the subject and would not achieve a pass grade no matter the effort they put in and support they get. The question is, how can performances in maths improve at the GCE ordinary level? 1) Employ more maths teachers so that each student’s needs could be attended to. Can you imagine 70 students in the same maths class with a single teacher? How can the teacher help those who are really in need on a one-to-one basis? In such situations, most students are lost and will only copy notes which will not help them in any case. Private schools (mostly Christian) do better in maths exams than those of government schools because there are less students in each class than in government schools hence the teacher can address individual student’s needs. 2) Separate the more able students from the weaker ones into different classes. Has anybody asked why students are taught quadratic equations when they are struggling to even do percentages? Mixing talented maths students with very weak ones in the same class (mixed ability classes) is a not a good idea if every student has to be given an equal opportunity to achieve to the best of his or her ability. There are students who can barely do addition, subtraction, multiplication and division, yet are taught very difficult algebra and geometry together with those who are excellent at the subject. The weaker students will be put off and their confidence will be lost. 3) The Cameroon GCE board should set two different maths exams; one exam can go up to ‘A’ grade standard and the other (weaker) should go up to ‘C’ standard. Schools will then register the good maths candidates for the Higher exam (the one that goes up to A grade) and the less able students for the Foundation exam (the one that goes up to a C grade). If this is done, the less able candidates will have a better chance of achieving a pass grade ( grade c ) as they will concentrate only on the topics that are relevant for their ability rather than waste their time doing a very hard exam that will only result in a U grade. 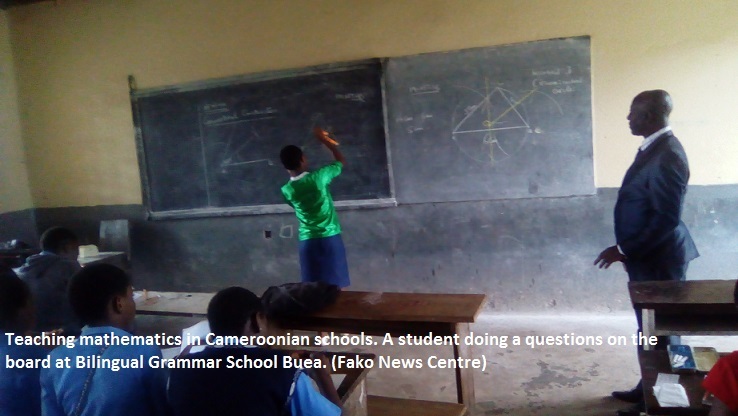 Cameroon inherited the GCE exam from Britain, but Britain has since modified its exams to suit the needs of its students irrespective of their abilities. Students in Britain don’t all do the same maths exam; the more able students do the harder exam that can take them up to an A* (grade A distinction) and the less able students do a less difficult exam that can take them up to a C grade(this exam does not contain the very hard topics so candidates cannot achieve more than a C grade. It suits the weaker students).